MICHAEL CHATWIN (pictured) has published a book about Nantwich Town Football Club, "Proud to be The Dabbers" (centre column). 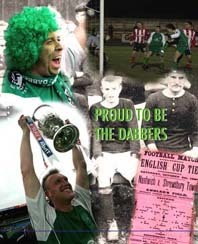 A press release when the book was launched said: " 'Proud to be The Dabbers' charts the fortunes of the UniBond Premier League club since it was founded in 1884. (‘Town’ was officially added to the club’s title in 1973). "Written by former club President Michael Chatwin, the 128-page full-colour book is lavishly illustrated and pays tribute to its Victorian pioneers, the characters who have served the club with such dedication over the years and, of course, the players who have worn the club colours with such pride. "Nantwich Football Club kicked off its first season in 1884/85 and from hosting Liverpool's first-ever F.A. Cup tie back in 1892 to lifting the F.A. Vase in 2006, most of those 125 years have been filled with incidents and tales. "Over the years, the Dabbers have crossed paths with England World Cup winners Alan Ball and Roger Hunt, the legendary Duncan Edwards and pre-war international stars such as Dixie Dean and Alex Jackson. From thrilling F.A. Cup encounters with Crewe Alexandra and Port Vale to a hat-trick of Cheshire Senior Cup successes, ‘Proud to be The Dabbers’ brings to life the club’s colourful and chequered history. “Michael says: 'Writing the book has been something of a labour of love. So much of the history of the club has been lost or forgotten over the years. l THE book, priced at £14, is available from the Club Shop at the Weaver Stadium (off The Waterlode in the centre of Nantwich), and Nantwich Bookshop, The Square, Nantwich. "Proud to be The Dabbers" can also be posted to you. Check with Michael on admin@nantwiochtownfc.co.uk for the latest cost. Then - as you will be told - cheques, payable to Nantwich Town FC, should be sent to: M.Chatwin, Nantwich Town FC, Weaver Stadium, Waterlode, Nantwich CW5 5BS. More about the book can be found on Michael's website: www.proudtobethedabbers.co.uk (ignore the date of the last update. It is fine) or the club's website: http://www.nantwichtownfc.co.uk. Select "History" and then "Club History" from the links at the top of the page. lMichael, a Dabber born and bred, has been a supporter of the club for more than 30 years. He first edited the club programme in 1979 and published the club's centenary book, "Centenary Dabbers" in 1984. THE Saltmen, The Wychers, The Lily Whites, The Dabbers. All nick names for Nantwich Football Club over the years. The first two mark the town's salt industry, the third was inspired by the white jerseys which were part of the club's strip after the Second World War, and the last is after the name used for all people born within the old Nantwich boundaries. This is just one set of facts that pepper Michael Chatwin's very readable 125-year history of the club. A double-page spread illustrates the range of club colours worn by the players - "virtually every colour under the sun," says Michael, up to the present-day green. Featured on one page is a letter from The Football Association, dated 10 December, 1973, telling the then Secretary, Jack Lindop, that the club could change its name from Nantwich F.C. to Nantwich Town F.C. They had been using that name for a number of years, but now it was official. Reading the 128 pages of the book can leave your head reeling with all the facts Michael has unearthed - and if that is not enough he includes links to websites where the reader can find out more. In his introduction to the book, Michael writes: "I have attempted to present a flavour of the club over the years. I have tried to avoid getting bogged down in statistics and records." He succeeds admirably in the both aims as his easy style of writing shows. But the facts are still there. And fortunately for those who like them - and which football fans don't - there are lists and tables covering such things as top scorers for the clubs, which players went where after playing for Nantwich, etc. from 1884, Michael drops in mini features on players or supporters - such as Jim Kettle, who will be 90 in February 2010, and who started following the team at the age of nine. Other well-known names drop neatly into the story as it unfolds. But research and writing is not all Michael brings to the book. He was also responsible for the "book design and origination" and shows a flair for that side of the publication, too. Even so, he told me: "To be honest, writing it was fairly straight forward - it was the design and origination that was tough going!" Well, it doesn't show. He can truly be proud to be a football writer and designer.